Cosmoprof North America, one of the largest trade shows in the U.S., was held at the Mandalay Bay Convention Center July 24-26 as part of its Professional Beauty Association Week. COURTESY Cosmoprof North America was held at Mandalay Bay Convention Center July 24-26 as part of its Professional Beauty Association Week. COURTESY Cosmoprof North America holds its convention every year in Las Vegas. Attracting more than 30,000 attendees, Cosmoprof North America has a staunch business-to-business platform as it is for beauty industry professionals only and is not open to the general public. The success of the trade show is based on the commerce and interaction of distributors, manufacturers and buyers of professional beauty products. With such a focus on the buyer, it is not surprising that the programming for buyers has dramatically expanded in the last decade. This year’s show included a Domestic Buyer Program to help buyers identify brands in foreign markets, an International Buyers Program for valuable foreign contacts and even an International Business Forum. 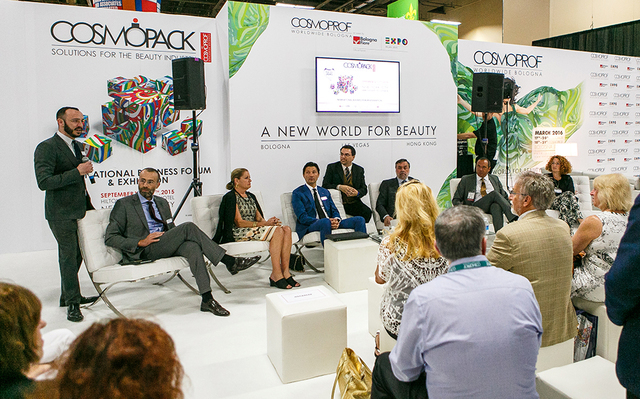 To cover the entire spectrum of the buying experience, Cosmoprof North America serves independent beauty retailers and the over-the-counter retail community by offering a special program for qualified attendees. For exhibitors who think their products are ready to be sold on television, Cosmoprof North America’s TV Shopping Program hosts key merchants from QVC and The Home Shopping Channel for an open casting call to review beauty product brands and even potential on-air talent. To help accomplish that goal, Cosmoprof North America offers an ‘Entrepreneur Academy’ that emphasizes financial literacy, legal resources, business pitching tips and strategies, as well as access to various subject matter experts. Like many highly visible or ‘glamorous’ industries, the business side of operations often gets overlooked. Its importance is not lost on Tyra Paylor, longtime salon owner and professional in the Las Vegas and Washington, D.C. markets. She now manages an Images salon in the Boulevard Mall. To celebrate the entrepreneurial spirit that is common within the industry, Cosmoprof North America hosts “INSPIRE: A Night Celebrating Beauty Entrepreneurs.” Along with a reception and dinner, the highlight of the evening is its Beauty Pitch 2016 event. Beauty Pitch 2016 is a “Shark Tank”-type event where three business startups and three established businesses with annual revenue over $5 million, pitch their companies for investment to celebrities and industry legends that include Kevin Harrington from the original “Shark Tank” and John Paul Mitchell from the famous Paul Mitchell line of hair care and beauty products. 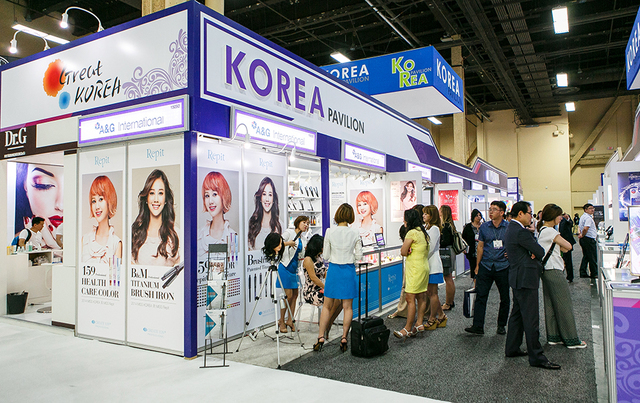 It is an experience that includes strong recognition and value of foreign markets and the trends that they often bring to the U.S. To help these foreign markets stand out individually, Cosmoprof North America hosts different country “pavilions” throughout the convention floor. These pavilions give each country the ability to not only showcase new hairstyles but other complementary products that may not even be available yet in the U.S.
Brazil, China, Italy, Morocco, Peru, South Korea and Spain are all represented with their own country pavilions. However, other countries not as associated with the beauty and salon industry are also represented, including New Zealand, Pakistan and Turkey. Cosmoprof North America is an experience that also comes with a competitive side. They host the North American Hairstyling Awards, a fiercely contested competition that emphasizes style, technique and innovation. The competition even has a red carpet reception. Special artistic presentations, live entertainment and special guest appearances are all part of the awards ceremony. Along with the current professionals, Cosmoprof North America pays due to the nation’s best current cosmetology students with educational and networking opportunities through its Beacon program. In its Beacon program students attend specialized classes taught by industry leaders, get up close and personal experiences with the finalists of the North American Hairstyling Awards and get several opportunities to increase their business acumen. Paylor sees the value in integrating current cosmetology students in recruitment efforts as she has spent the spring and summer conducting outreach to recent high school graduates to identify prospective students and employees.